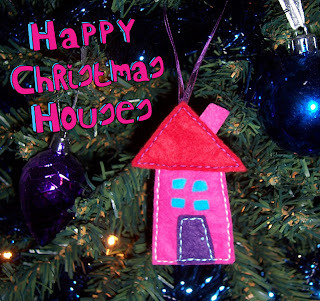 This weekend I want to share a tutorial to make a cute little house for your Christmas tree. I made my little house in bright colours, because these were the scrap bits I had left after my star garland making last week. And your house is done! These would also make cute gift tags, or even new home gifts! You could add some lavender into the house to make a scented draw thingy (gah what are those called?). But yeah, lots of options! This entry was posted in Christmas, Christmas 2012, Christmas Tutorials, Felt, Seasonal, Tutorials on December 16, 2012 by Handmade Cuddles.